The most recent general news article summaries are displayed here. For a complete list of general articles, see the archives box at the bottom of this page. 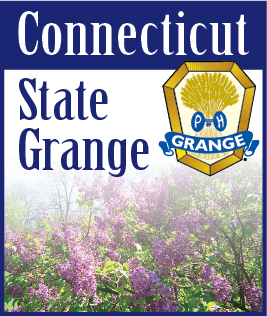 APRIL 21, 2019 -- Eureka Grange is hosting a Baked Potato Extravaganza and Bake Sale on Saturday, May 11 at Eureka Grange Hall, 777 Litchfield Turnpike (Route 202), in the Nepaug section of New Hartford, from 5:00 to 6:30 PM. APRIL 16, 2019 -- Hillstown Grange will be holding a Pancake Breakfast on Saturday, May 4th from 8:30 am to 11 am. Take a break from spring planting and come relax and enjoy pancakes, sausage, bottomless cups of coffee, tea and juice for just $5. April 14, 2019 -- We are in the homestretch for our 130th Anniversary being held on Friday, May 31. Time: 7:30 P.M. Please save the date. Our program for April is “Easter” in the charge of Lecturer Judi Reynolds. Joanne Muscillo will be hostess. Our April clean-up Day is Wednesday the 17th - time 1:00. Come and give us a hand. APRIL 11, 2019 -- Hillstown Grange is holding a $1 Hot Dog dinner and Let's Get Gardening event on Thursday, May 2nd. Doors open at 6:00 p.m for $1.00 Hot Dogs and $4.00 for 3 sides, dessert and drink. April 10, 2019 -- Apr. 13: Show and Tell May 11: Lilacs and Tulips – Baking Contest. Our program on the Shakers, especially those who lived here in Enfield, was educational in not only in what they believed but what they accomplished as a community. Several of their local buildings are still standing and still in use as private residences.